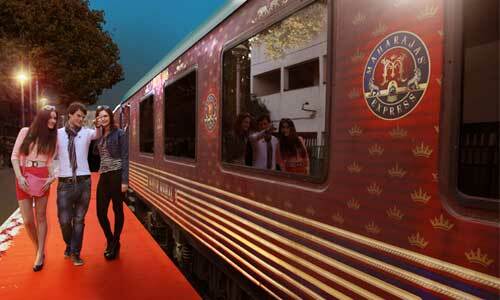 The Maharajas Express has a total of 14 guest carriages which have got its names after various precious stones such as Moti (Pearl), Heera (diamond), Neelam (Blue Sapphire), Feeroza (Turquoise), Monga (Coral), Pukhraj (Sapphire) and so on. In these carriages are fitted luxury cabins that are segregated in four categories - Deluxe Cabin, Junior Suite, Suite and Presidential Suite. Out of these, the Presidential Suite, called Navratna spreads itself in an entire carriage is inclusive of two bedrooms, a separate living area, a dining room and a modern private bathroom with a bath tub. These cabins and suites have the capacity of accommodating 88 guests. The tasteful and royal décor has taken its inspiration from the carriages of the erstwhile royalty of the country which is unmatched for. The cabins are adorned with rich tapestry, linen, upholstery, wall-to-wall carpeting, semi-precious stones and antiques. During your journey, enjoy the beautiful scenery whizzing by from the huge panoramic windows. While having a traditional royal décor, the spacious cabins offer every modern-day facility at par with the International standards. Every cabin is well-appointed with services and amenities like LCD TV, Direct Dial Telephone, choice of twin or king-size bed, Channel music, electronic safety deposit, private bathrooms with plus toiletries, DVD players and much more. Equipped with facilities such as LCD TV, direct dial phones and internet, these spacious cabins offer sumptuous accommodation to the guests in these elegant interiors. Comfortable beds, attached bathrooms and pastel colors radiate an artistic finesse which has gone into the design of these suites. 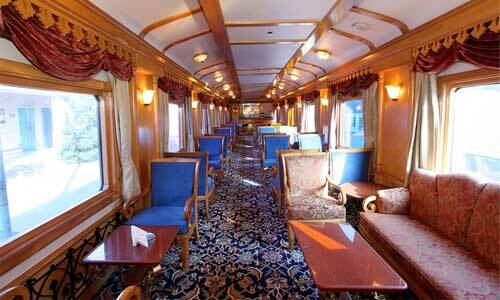 There are 20 junior suites with maximum capacity of 36 passengers. Four tastefully appointed suites with capacity to accommodate 8 passengers are a work of art in themselves. Sylvan furnishings, modern amenities and tasteful elegant adornment are reminiscent of the splendor of a bygone princely splendor. 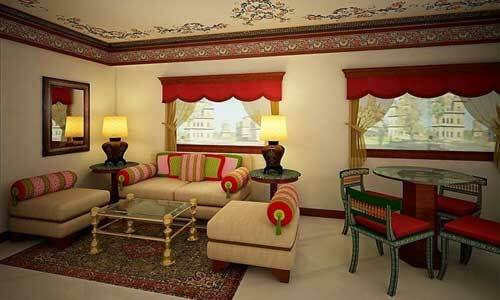 Live like a royalty in the quaint décor of these lavish suites equipped with contemporary amenities.